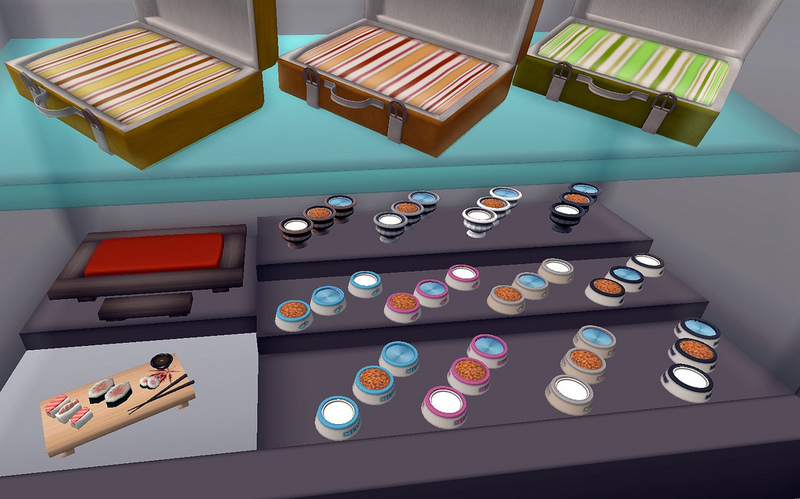 A Sneaky peek at the Kittycats sim! So the Kittycats Beta testers got a sneak preview of their newly opened central location earlier, and boy, is it something! I can barely contain my excitement! It’s a wonderfully landscaped sim featuring a swanky central store building designed by none other than uber-creator Barnesworth Anubis. This is where you will be able to purchase all your kittens, as well as a vast array of food, bedding and treats. Just inside the entrance, on each side, are two visual displays featuring a sequence of cats engaged in various feline escapades They’re super cute actually; on the left is ‘Shabby Tabbys’ which is a shabby-chic scene styled by Aurora Jacks featuring a variety of breeds in a gorgeous home environment.I was tempted to set it to my home location! To the right is ‘Tropicats’ styled by Callie, featuring cats chilling out on a tropical beach. I wanted to jump into the frame and soak up the rays beside them, but I also wanted to explore a bit more, and see what other goodies I could discover..The answer, was of course, plenty. You walk out into a courtyard where two cats are engaged in a game of chase around a fountain (madness!) and this point leads to different sections; ‘Accessories’, ‘Food And More’ and ‘Kitties and Packs”. Starting on the left you’ll find a wide range of coloured sacks to choose from in the ‘Kitties and Packs’ section, and by the looks of things you can buy individual, paired and multiple-pair packs. I would have loved nothing more than to scoop up every sack and shove it in my underwear before beating a hasty retreat, but alas, I would have been spotted:( The range of colours that have been chosen for the Kittycats merchandise are pretty special; the styling is top notch and this is amply reflected in the ‘Food and More’ section of the store. The eats look a treat,and you can purchase various consumable enhancements, as is the way with most breedables, here too. Some of these are labelled like vitamins, a very novel approach, and each individual object is textured to perfection to make it look just right. This kind of attention to detail and design excites the hell out of me:) Moving on, and if you thought you’d seen every single cat bed on the market then you’re in for a treat in the ‘Accessories’ section. There are all kinds of amazing items here; ranging from simple round cushions to chaise lounge as well as the practically obligatory scratching post. All familiar, yet each one has a unique Kittycats twist ensuring that this is a brand that stands out on its own. But of course, it’s all about the cats isn’t it? I saw lots of different coat colours today, many that I hadn’t encountered before, and this was also my first opportunity to see the cats being held by their owners. I’ve been impressed previously by the animations upon these cats, but now I’m also struck by how lovely the holding pose is. It’s animated, allowing for fidgeting ( Ever tried holding a cat? They don’t sit still for long..) and looks very natural and loving actually, which is just the way it should be. Oh, and I didn’t know until today that you can wear the Kittycats on your shoulder when they are kittens!! LOOK! In summary then, the sim and the store totally evoke the exclusive vibe that these beautiful cats have oozed from the start. 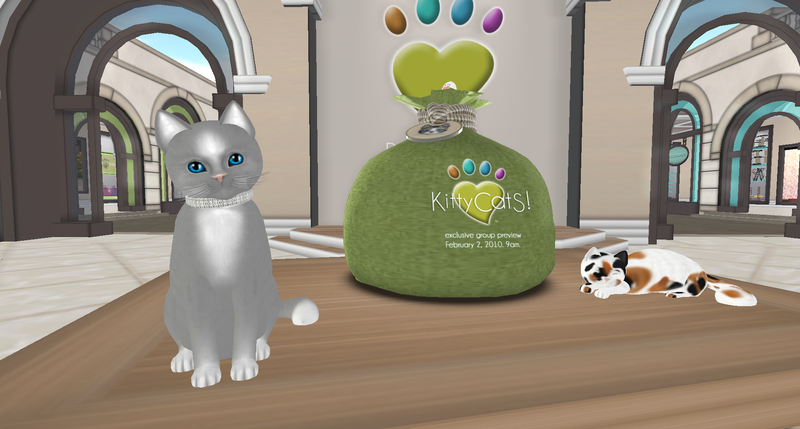 Purchasing a cat here will add reams to the experience of being a Kittycat owner, and the entire space oozes with the quality of design and attention to detail that has been a fixture of this breedable from the start. I just cannot properly express my satisfaction at seeing the sim; it’s obvious that a lot of hard work has gone into creating these cats and the design team deserve to be rewarded for their efforts. One final point: I’m even more certain now that Wildwoods and Kittycats can co-exist happily on the grid because each one plainly caters to different markets. They may both be cats, but they couldn’t be more different..and I’m so grateful for that. They both offer different perspectives and challenges for the in-world breedable pet keeper, and I’m besotted with both of them. I said previously cut me and I bleed Wildwood? Well, I think I’ve become infected by the Kittycats virus too, and it’s turned me mud-blood. And I couldn’t be happier! Wildwood Cat Auction Tonight 2pm SLT/10pm UK..